Block #12, the Log Cabin. According to Jinny Beyer, this version is credited to Grandmother Clark’s Old Fashioned Quilt Designs, Book 21, 1931. Grandmother Clark publications: W.L.M. Clark, Inc., of St. Louis, MO, published a series of booklets titled Clark’s Series of Art needlework Books. From background (Kona Pond – green in block above) cut 1 – 2″ square and 1 WOF strip – 1 1/4″ wide. From strip, cut 1 – 3 1/2″ piece, 2 – 4 1/4″ pieces, 1 – 5″ piece, 1 – 6 1/2″ piece, 2 – 7 1/4″ pieces and 1 – 8″ piece. From accent fabric (Purple tone-on-tone in block above) cut 1 WOF strip – 1 1/4″ wide. From strip, cut 1 – 2″ piece, 2 – 2 3/4″ pieces, 1 – 3 1/2″ piece, 1 – 5″ piece, 2 – 5 3/4 pieces, 1 – 6 1/2″ piece, 1 – 8″ piece, 2 – 8 3/4″ pieces, and 1 – 9 1/2″ piece. TIP: Be aware when you are cutting your width of fabric (WOF) strip, as 1 1/4″ is very narrow, to hold your ruler firmly so you get a straight consistent cut. 1. 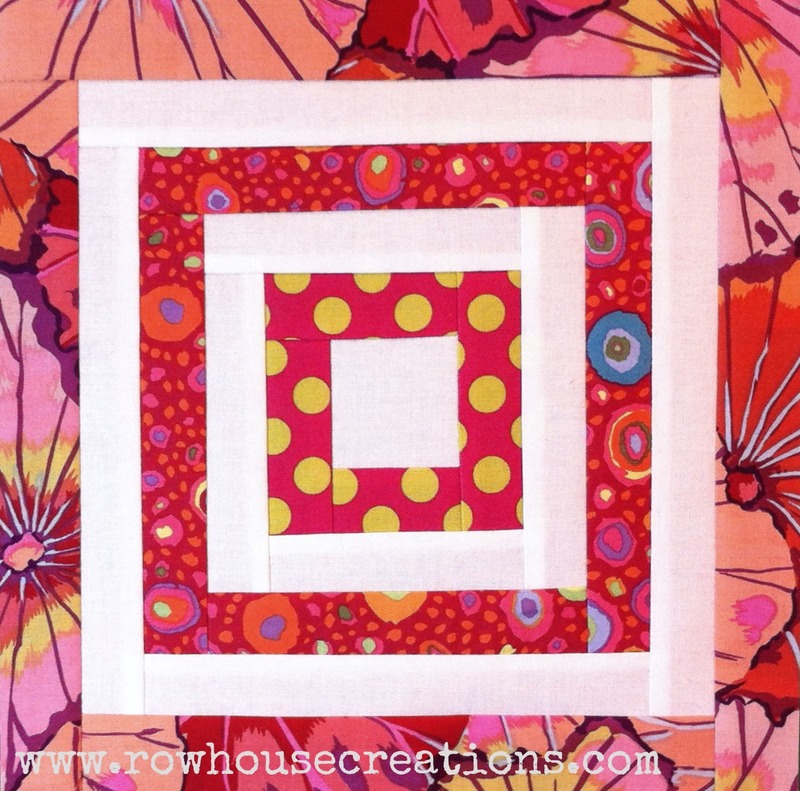 Join the 2″ background square and the 1 1/4″ x 2″ accent fabric piece. Press. Check your scant 1/4″ seam allowance for accuracy before proceeding. 2. Add a 1 1/4″ x 2 3/4″ accent fabric rectangle along the adjacent side, and repeat on the third side. Press each seam open as you go. Add the 1 1/4″ x 3 1/2″ rectangle to the fourth side. Press to complete first round. 3. Repeat by adding background rectangles around your center square, increasing in size each time. Continue to add accent and background fabric rounds until your block measures 9 1/2″ (unfinished). 4. 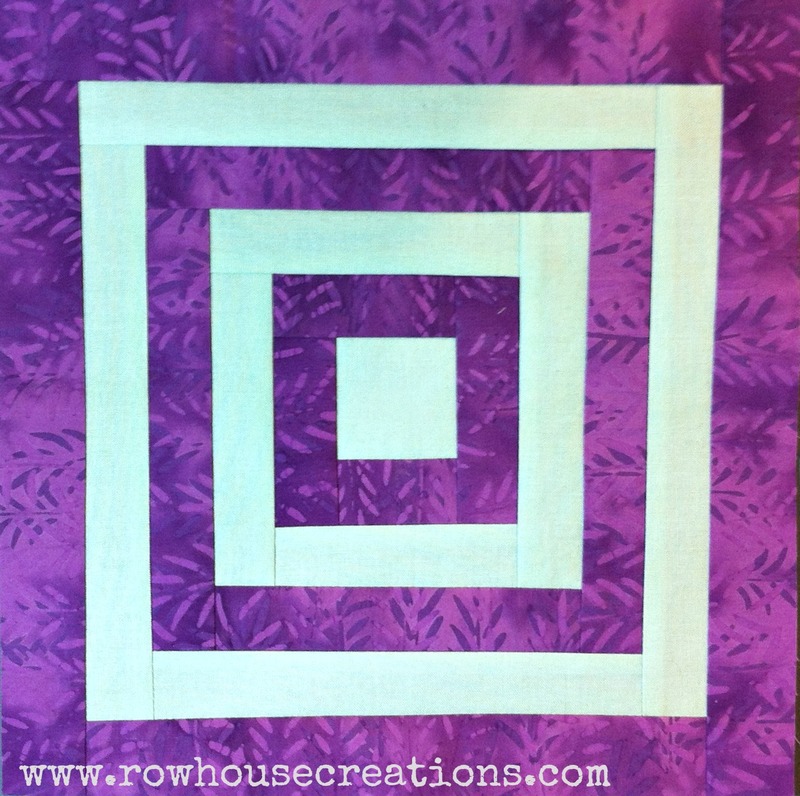 Square to 9 1/2″ (unfinished) to complete one Log Cabin Block. If you want to make your block with three accent fabrics, instead of one, like mine is, referring to cutting instructions above, cut the rectangles in red type for your inner strip, cut the rectangles in green type for the center accent strip, and cut the rectangles in blue type for the outer/final strip. The background cutting is the same for either version.